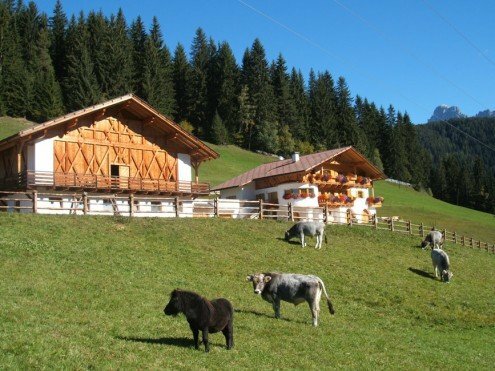 The farm Karerhof is situated in a high alpine location, just five minutes by car from the romantic centre of the South Tyrolean mountain village of Nova Levante. 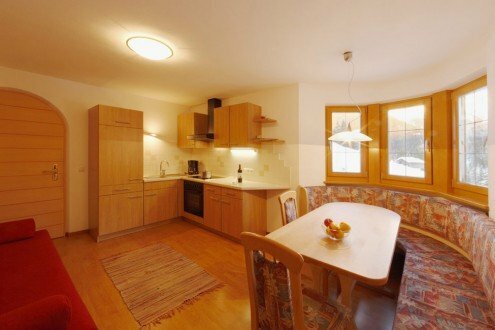 You will spend your holidays in an apartment on the farm at 1,450 meters above sea level. In the quiet hillside location, no noise disturbs the rural idyll. Green meadows and dense forests surround the farm Karerhof, and the striking rocky summits of the Catinaccio and the Latemar will create a magnificent backdrop for your holidays. Hikers and nature lovers will be fascinated by the peaceful countryside. In the tranquil surroundings, everyday stress and hectic will be soon forgotten. The tranquil life on the farm Karerhof in Nova Levante offers a contrast to the hectic life in the city. 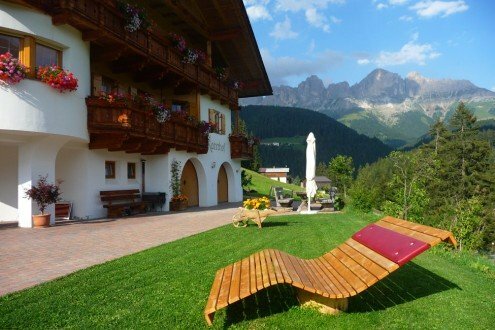 Here, you will have the opportunity to experience the rural country life first hand and in the peace and quiet of the alpine surroundings you can recharge your batteries. Beautiful hiking trails starting right behind the farm Karerhof lead into the natural landscape. On the balcony of your apartment or on the large lawn you can enjoy the sunshine. Many animals live on the farm. Besides cows, cats, goats, sheep and chickens, there is also a donkey on the farm Karerhof. Your hosts will gladly provide fresh farm products. Enjoy home-made jam for breakfast, juice, tea, bacon and eggs from happy chickens, as well vegetables and berries from the farmer’s garden. Four lovingly furnished holiday apartments with comfortable amenities await you during your farm holiday in Nova Levante. They are designed for 2-4 and 2-5 persons and cater to every wish. A fully equipped kitchen unit is available, and in the spacious living room you will find a TV with satellite connection. Large and modern bathrooms with shower, bath tub, toilet and bidet ensure high comfort; the bedrooms are equipped with a large double bed. Your apartment has a lovely sunny balcony and your kids can play freely on the farm’s playground.